Deciding on the trees to use for screens and hedges is a big decision. Not only are these features going to set the form of your garden, and give you the privacy and protection you need, you will make a significant investment in them, so you want to get it right. 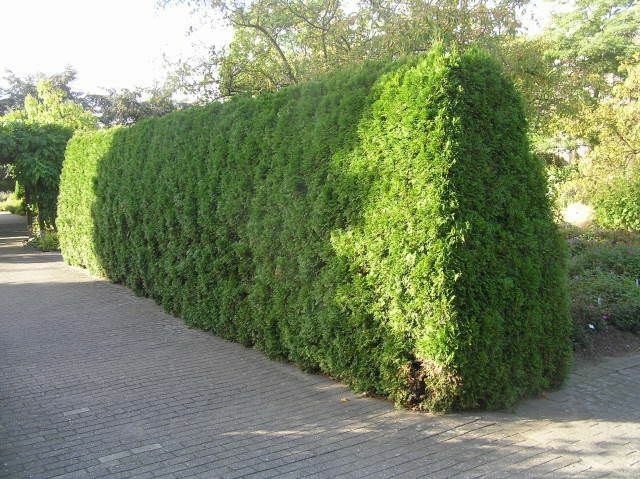 Let’s look at why choosing Thuja Green Giant is going to be the right choice for almost all situations. The rapid growth of Thuja Green Giant, especially when young, has been proven in independent University trials. It grows faster than any other hedging evergreen we know off, adding up to 4 feet a year in the early years. Usually it will grow less the first summer after you plant it, although if planted in spring and cared for it will often be well established by the first fall. It is in the 3 or 4 years following that period of establishment is when you will the fastest growth, with your plants adding 3 or 4, or in exceptional circumstances even 5 feet a year. This means that in those first few years, when you are anxious for the promise of privacy and screening to actually happen, Thuja Green Giant delivers. By the time you have had your trees in the ground for five years you can realistically expect them to add 10 feet or more to the height they were when you planted them. After that, growth with slow down, and adding two feet a year, and later just one, is normal. This is great, because by then your plants will be the size you want them, and slower growth means less trimming is needed. Speaking of trimming, for screening you don’t even need to do it, although an occasional shaping helps keep your trees extra neat. Unlike many other fast-growing plants, Thuja Green Giant doesn’t begin to fall apart in a few years. Instead, it stays dense and tight, resisting wind, snow and storms, and always looking great. A common issue with a lot of evergreen hedges is discoloration in winter. A hedge should be fresh and green, but a lot of the plants used can and do turn bronzy-brown in winter, once some serious cold arrives. Yes, they do green up again in spring, but it does mean that they look dull and even unsightly in the winter months. At that time we want to see something green, to keep our hopes up for the coming spring. This is where Thuja Green Giant stands out from the others. It really does live up to its name, and your plants stay green and lush throughout the coldest parts of the winter. We don’t know about the ‘Jolly’ part, but the ‘Green’ part is certainly true! The last thing we want in our gardens is problems with hedges. They are meant to stay in the background, look good, and need limited attention. This is not always the case with some of the plants used. For example, older plantings of Leyland Cypress have been attacked by diseases in some areas, and other evergreens can also suddenly decide to start dying. Thuja Green Giant became so popular so quickly precisely because it stays healthy, and it keeps growing vigorously in many different locations and soils. It grows well in all kinds of soil, from sandy soils to clay soils, and in everything in between. It doesn’t like to be growing in soil that is constantly wet, but even then, if you plant your hedge or screen on a raised ridge of soil, up to 12 inches above the surrounding soil level, it will grow well in difficult, wet sites too. It is also remarkably pest and disease resistant, because it is a hybrid plant, and plant breeders have known for years that when we cross two different species or forms that are related, the resulting plant is tougher and more vigorous than either of its parents. They call this ‘hybrid vigor’, and Thuja Green Giant has it in spades. When planting hedges and screens, we don’t want plants that are choosy about where they live. With Thuja Green Giant we don’t have those problems. It is hardy all the way from zone 5 to 8, and even into zone 9 in drier climates. You might live in the rainy north-west; the hot and humid south- east; the colder north-east; or all across the open mid-west. It really doesn’t matter to this tree, because it is vigorous and adaptable enough to thrive almost everywhere. North America has an enormous range of climates, but growers in almost all of them tell us that Thuja Green Giant is thriving there. Even in coastal areas this is one of the best choices for everywhere short of right on the beach, because it is more salt-resistant than other arborvitae (Thuja) trees are. So no matter where you garden, you can be pretty sure that this is the best plant to choose. Finally, we don’t want to be fussy about our hedges, and they should not need a lot of regular attention. Thuja Green Giant doesn’t. It is of course best to give it some TLC in the first year or two, paying attention to watering it regularly, planting it into well-prepared soil, and using fertilizer to maximize the growth during those critical early years. Regular trimming right from the beginning is recommended too, for a hedge, as that builds a strong internal structure that will keep it healthy and lush right to the ground for life. But after that small push in the early stages, Thuja Green Giant, like children we have raised successfully, can stand on their own feet from then on, and really only need to be trimmed once or twice a year, depending on how neat or natural you want your planting to screening to be. You can see from all this, that for all the right reasons, choosing Thuja Green Giant is the right choice for almost every garden, almost everywhere. It is the green parts of plants that we see, and beneath the ground is often ignored. But for trees, that area is so important, as vital activities happen there. Successful growing should emphasize what we do with the root system, and if we do that, the upper parts will usually take care of themselves. Let’s see what we should be doing to care for the roots of our evergreens, to give us the fast and healthy growth we want to see. We are (hopefully) going to consider how much room above ground our plants need. 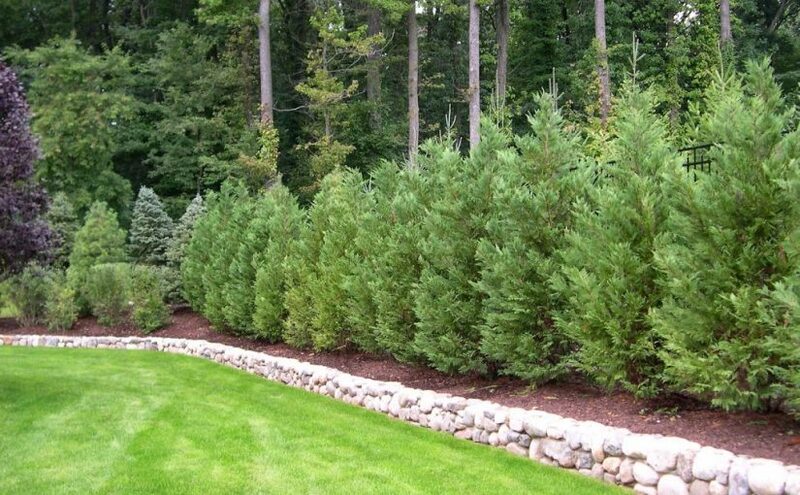 For example, Thuja Green Giant has a spread of as much as 12 feet, so it should not be planted closer than 6 feet away from walls, fences, property boundaries and foundations. Its root system takes up even more room, and although it will adapt to obstructions, growing around or underneath them, you cannot grow a full-sized tree in a very small volume of soil. So when planting around buildings, or between construction features like driveways and garden walls, consider if you have enough room. As well as your plant suffering, your construction can too, as large plants too close to retaining walls can weaken them and cause their collapse, and planting right alongside a walkway or drive can result in cracks and lifting developing in a short time. For the best growth of your trees, creating a large volume of soil is essential, as often the ground is too hard for them to easily penetrate. This is especially true in newer properties, as heavy construction machinery will have been driven over the site, making the soil hard and unyielding. This problem is called ‘compaction’. Soil where you are planning to grow Thuja Green Giant, or other trees, should be dug or roto-tilled to loosen the soil. For a hedge a section at least 3 feet wide, and preferably wider, up to 6 feet, should be dug or tilled to a depth of 12 inches, or as deep as you can go. For individual plants, an area at least 3 feet in diameter should be prepared. This will separate the pieces, and even if your soil is poor, it will make it much easier for your young trees to spread out and down, finding water and nutrients over a large area, and so growing stronger and healthier. This is far better than planting into a small hole in hard soil, and then finding you have to water all the time and fertilize too, to keep your plants growing. The extra work of good soil preparation will be re-payed many times over with great growth and good health. No matter what type of soil you have, adding organic materials to it will improve it. In sandy soils, it helps retain moisture and provide nutrients, and in clay soils it improved drainage and air penetration into the soil. Suitable materials include garden compost; well-rotted animal manures like cow, sheep or horse; rotted leaves; spend mushroom compost; peat moss; or almost any other well-rotted organic material. Do not use woody material (such as wood chips) as these things rob the soil of nutrients as they decompose, and only years into the future do they feed your plants. Usually a layer 2 to 4 inches deep over the area is sufficient. Spread it over the surface and dig it in. If you are using a tiller, run over the area once, spread your organic material, and then till one or two more times. Mixed into the soil it will hold water for the roots, and as it rots down it creates drainage, and releases nutrients too. Once you have finished planting and watering, then spread another layer 2 or 3 inches deep over the dug area. Keep it away from the stems of your trees, and don’t cover the low foliage close to the ground. This layer will act as mulch, conserving moisture. It will also prevent the growth of weeds, as these should not be allowed to grow up around your plants, especially when they are still young. As well, mulch of this kind, rather than bark chips or stones, will feed your plants too, as it rots down into the ground. Mulch should be renewed in spring for a couple of years at least after planting, and if your soil is very sandy, mulching each year is recommended. In richer soils it is not so necessary, and it may only need replacing every two or three years. The soil is where your plants get water from, and even if your plants look healthy and green in dry soil, they are not growing. So watering is often necessary, especially when plants are young, and especially in sandy soils, and in hot places. New plants should be watered at least weekly during dry weather, even in the temperatures are not so high. Remember that newly-planted trees depend for a while on the root ball that was inside the pot, until they spread their roots outwards. So even if the soil looks damp, that root ball may have already dried out. Use a slow-running hose to trickle water down around the roots, rather than standing with a spray nozzle and squirting water about. Most of that will be wasted and simply evaporate into the air. This watering during the establishment phase is vital for your plants to get off to a flying start and put on lots of new growth for you. In the longer term, putting in a trickle line will make watering easy. This can be connected to your irrigation system is you have one, or connected directly to a tap with a timer so that it comes on automatically, meaning less work for you. New plants can take several years to develop an extensive root system. Without that they may not be able to access enough nutrients for maximum growth, even if you have enriched the soil. Today chemical and natural sources of fertilizer are available, so you can use which ever kind you prefer. The important thing for growing evergreens is that there is enough nitrogen in them for growing all those green shoots, especially if you are clipping, which removes the growth which then must be replaced. Look for fertilizers with a high first number in that set of three – it is the level of nitrogen. It should be close to 10 in a natural fertilizer, and close to 20 in a chemical one. The simplest approach is to choose a blended fertilizer designed by experts for evergreens. Apply this a week after planting, unless you are planting in late fall or winter. If you are, wait until spring to fertilize, and in sandy soil or in the early years, a second feeding in mid-summer and another in early fall is beneficial, especially in warmer zones. In colder areas a spring and summer feeding should be enough. With these steps – dig and enrich the soil, water regularly, and fertilize – you will see the best growth possible. It pays to focus on the ground if you want the best results in the air. Thuja Green Giant is the most popular fast-growing evergreen, across a large part of the country, for hedges, screens and large specimens. Always fresh and green, with dense, upright growth even when untrimmed, it’s perfect in many locations. Like raising children, getting plants off to a good start in life is the key to future success, and Thuja Green Giant is no exception. So, let’s consider the best way to do that, so that your new plants become established quickly, without any transplant shock, and take off growing fast from day one. The period of fastest growth is between the second and fifth year, where growth-rates well in excess of 3 feet a year, and possibly up to 5 feet, are possible. That period, when your new hedge or screen develops into something substantial, will kick in sooner, last longer, and give you the most growth, if you have planted your trees well and giving them some extra TLC to get stared. Good soil preparation, no matter what kind of soil you have, is key. There are three principle things to think about, and the most important is opening up the soil to let the roots quickly spread out and down, to find water and nutrients. So be prepared to dig a larger area than the pot – the most common mistake is to dig a hole in hard soil that is just barely big enough to fit the root-ball into. If you are planting a single tree, then the area you dig should be at least 3 times the width of the pot – and more is better. It should also be deeper than the pot, although this is much less important than width, as most tree roots are found in the top 12 inches of soil. If, when digging, you hit a hard, bottom layer, perhaps of clay or stone, as long as it is more than 10 inches down you don’t need to attack it. 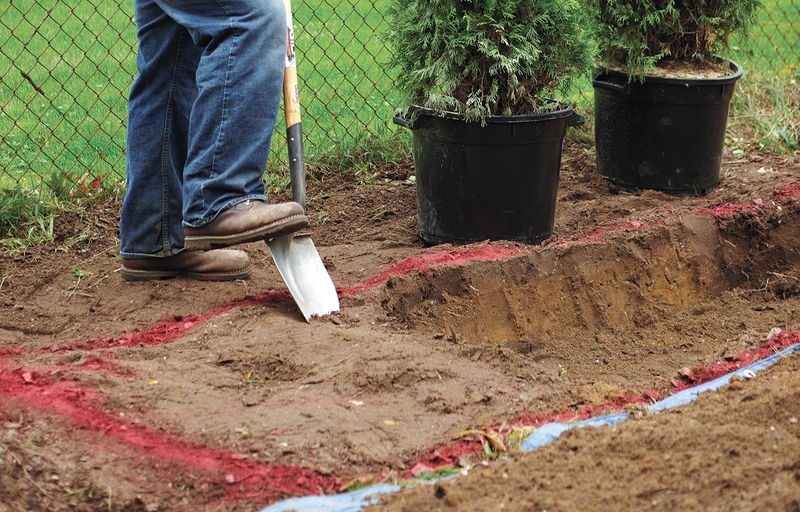 Focus on turning over and loosening that top area, to the depth of a full-sized spade or shovel. For a single plant, or a small group, a spade is all you need, but for a hedge it pays to rent the biggest roto-tiller you can find and prepare a strip of soil at least 3 feet wide, or even wider. When using a roto-tiller you can be fooled by it, because you will immediately see nice soft soil. It is very easy to just scratch the surface, and you may need to go over the area two or three times to get down deep enough. Move very slowly, because the faster you go the shallower the prepared soil will be. Secondly, add organic material to the soil. The type is less important, it is the doing it that counts. It can be almost anything, from garden compost or rotted manure, to rotted leaves, grass clippings, or peat moss. Just don’t use anything woody, like shavings or bark, because these will rob the soil of nutrients, not add them. Keep those materials for mulches on top, not mixed in. Put a layer several inches deep – 2 to 4 is about right – over the soil before you start tilling, and you don’t need to remove any fresh weeds that might be there, just dig them in. If you find thicker white roots of weeds like thistles or dandelions, then take those out, but otherwise you can leave fresh weeds to rot down. Once you have prepared the area, rake it level and you are ready to plant. Thuja Green Giant will grow into a wide plant up to 12 feet across, so give it room. Plant no less than 6 feet away from walls, fences or your property line, and when planting a hedge or screen allow between 3 and 6 feet, depending on how dense you want it. If you plant closer than 3 feet apart the plans will struggle with each other, and grow tall, but spindly, with the lower branches dying in a few years, leaving gaps, rather than dense foliage right to the ground, which is what you need for a good hedge. Water the pots thoroughly the day before you plant. Don’t plant into dry soil – if necessary, water the area well a couple of days before. If the roots are spiraling around inside the pot, take a box cutter or sharp knife and cut down the sides at two or three places, and across the bottom in a cross. This will encourage the roots to grow out sideways, rather than keep spiraling, which can lead in future years to strangulation of the growing trunk. Don’t worry, you won’t hurt your plants by doing this – just the opposite. The roots will quickly grow out, exploring that great soil you prepared. Plant at the same depth as in the pot – don’t bury your plant with more than an inch of soil on top of what was the surface of the pot. Use plenty of water when planting. This is not really about watering the plant, but it brings the soil closer to the roots, and eliminates air-spaces. Again, this encourages rapid outward growth, and early establishment. The best way is to place the tree in the hole, put back about two-thirds of the soil, and then fill to the top with water. Replace the rest of the soil once that water has drained away completely, and firm it down again. You don’t really need to water again after that. Follow up with regular watering throughout the first growing season. Once a week is usually enough, but if you have very sandy soil, or if the weather is very hot and dry, twice a week may be necessary. Don’t rely on showers or thunderstorms, but you won’t need to water if you have a solid day of rain. Water each plant close to the stem with a slow-running hose, as the original root ball is the part that will dry out first. Standing and spraying with water is never as effective. For a hedge, putting in a trickle-hose irrigation pipe makes it very easy. These are inexpensive, and they can be attached to a tap with a timer, so you can just forget all about it and have your trees watered on a regular schedule. If there are watering restrictions in your area, see if you can divert the water from your washing machine or shower into your garden – it’s a great way to be water-responsible and still grow your garden. Thuja Green Giant is a fantastic, fast-growing evergreen, but when we look at how it is planted in most gardens, there does seem to be a lack of imagination. The nation is covered in straight rows of this tree, standing alone in a neatly-mowed lawn, and I hate to say this, guys, (because it is mainly guys that seem to like this row of soldiers) but there is so much more that can be done. I know that your goal is to mark the boundary of your property, and probably also to block an unsightly view, bring privacy to your garden, or perhaps to reduce wind and snow drift in winter storms. Well the good news is that you can do all those things – and more – with something more imaginative than a blank wall of green. Clipped hedges I get and have always loved. The geometry itself becomes a garden feature, especially when used as a backdrop to shrub beds. But if you are aiming for low-maintenance, without trimming, then with a little more thought so very much more can be achieved. What I am talking about is planting among and around those Green Giants with other plants and building a more natural-looking privacy screen. Sometimes, when space is limited, we need to keep everything in a row to fit it in, but if you have room, consider a different approach. Let’s say you have 100 feet to screen, and very smartly want to use Thuja Green Giant. Typical single-row spacing is between 5 and 10 feet apart, depending on how dense you want it, and how soon you want it to become solid. Now if instead of seeing this as a 100-foot-long straight line, what if instead we see it as also 15 feet wide. Now, instead of a neat row, with everything spaced evenly, we were to take our trees and plant them in groups of 2, 3, or 5 trees, allowing about 6 feet between each plant, diagonally to the row, or in triangles. Space these clusters about 15 feet apart, and now you have a more naturalistic planting, with interesting groups of plants overlapping and creating a much more exciting skyline. If you have even more width available, you can create overlapping diagonals with rows of these scattered clusters, so that you avoid gaps between them, yet also avoid that straight row effect. But a better approach to that gap is . . .
Now we start to have some fun. If you create those clusters, and perhaps put them further apart – maybe 20 feet – then you give yourself the chance to make your screen even more interesting. Into those gaps you can plant something completely different. Consider the purpose of your screening. Is all-year-round privacy vital, or do you need it mostly in summer? If it’s an issue for summer only, then why not add some deciduous trees? The exact choices will depend on where you live, but these could be trees with fall color, like maple or oak, or flowering trees, like cherry or deciduous magnolia. Smaller trees, like Birch, as top choices for this, and birch is also fast growing, so they won’t get left behind. More upright trees, like the Tulip Tree (or Tulip Poplar) fit well too, and they will never have branches spreading into the evergreens. 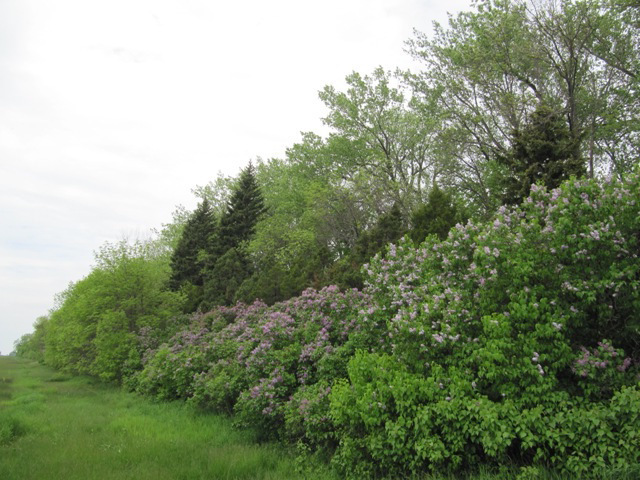 If the area you are planting is exposed, then tuck those flowering trees closer to the evergreens, on the south side of them, while still putting them partially into the spaces. Crape Myrtles are a great choice too – some become tall, and all are fast-growing and incredibly colorful. Like the Thuja they are drought resistant and do well out in the open. Alternatively, you can use evergreens. These could be other conifers – perhaps with contrasting foliage color, such as some of the blue spruce, like Baby Blue, or the hardy Colorado White Fir, or beautiful Blue Spanish Fir. Alternatively, holly is a great screening plant, and there are a host to choose from. Pick something upright, with a good berry crop, like the classic ‘Nelly Stevens’, or the fiery ‘Dragon Lady’. If you are in zone 5, choose a hardier hybrid, like ‘Castle Wall’, or ‘Castle Spire’. Once you start thinking in terms of variety, instead of sameness, then many options open up. Remember to match your choices to your growing zone, and choose plants that will grow large fairly quickly, or they will be lost among those big Green Giants. Other evergreen options might include Cherry Laurel, which besides its big green leaves contrasting with the fine Thuja Green Giant foliage, has attractive flowers too. In warmer areas the Wax Myrtle is a lovely upright evergreen, with small glossy leaves, and it’s tough too. So far we have been looking at taller plants, to form the backbone of this mixed screening, but there are also the sides, if you have room. On one or both sides there is an opportunity to add flowering, different plant forms, and fruit for wildlife. In open, treeless areas in particular, screens are valuable refuges for birds and smaller wild-life, providing shelter from storms and sun, nesting sites, and also food. Planting berry shrubs, like Pyracantha or Barberry makes sense. To add greater density, those Cherry Laurels already mentioned are great, and along the sides you can use smaller forms like ‘Otto Luyken’. For early spring flowering, you can’t go wrong with the tough, golden-yellow Forsythia. Why not add some fragrance, with some lilac bushes – perhaps something compact like ‘Miss Kim’, or the remarkable Bloomerang Purple Lilac, which has a second flowering. Don’t plant just one shrub, but instead create drifts, using several, and spacing them apart about 2/3-rds of their mature width. In other words, shrubs that become 6 feet wide would be planted about 4 feet apart. By now you have will have got the idea of this. Think of clusters of reliable and fast Thuja Green Giant, mixed with taller trees – broad-leaf evergreens, plus flowering or deciduous ones, and colorful conifer evergreens too – that will add variety and interest. Then edge it on one or both sides with drifts of shrubs. Think of interest at different seasons – fall color, berries, spring or summer flowers – you get the idea. Instead of the rigid line of ‘all the same’, you can create a colorful and interesting picture, and still achieve the screening you are looking for.